Last week I set out for my Monday session for my Kickstart Post. For reasons beyond my understanding, lately I’ve gravitated to Mount Washington. To say this location is overdone is not necessarily inaccurate but there is a reason people flock here…it’s one hell of a view. Since I like to have a theme for these posts and I get questions pretty frequently about my processes, both shooting and processing, I thought I’d make this latest installment an example about one of the tools I use in the field. That tool is the Graduated Neutral Density Filter. This will be a brief synopsis of the particular filter I used for the photo above. In the photo above, you will notice a dramatic difference in the exposure in the sky. Different shutter speeds, right? Negative. If you look at the skyline and the foreground of both photos, you will see they are pretty evenly exposed. So how is the sky darker in the second image? I used a Graduated Neutral Density Filter (ND Grad). Without getting into too much detail, an ND Grad filter is clear, neutral glass on the bottom which, halfway up the filter, gradually transitions to an opaque but still neutral coating which blocks the transmission of light to the camera’s sensor for that part of the image. More simply stated, it effectively makes the image darker for the portion covered by the top of the filter. 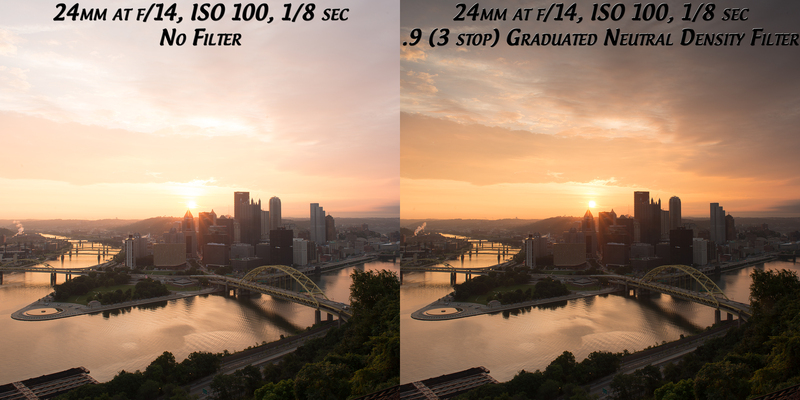 Again, referencing the example, I used a .9 (3 stop) ND Grad filter. You’ll notice that the camera settings are identical for each photo yet the sky is dramatically different. The 1/8 second exposure is good for the foreground but the sky is entirely too bright and the highlights are overblown. After placing the filter on, I kept the exposure at 1/8 second but since the light for the top image was “blocked” by 3 stops, the effective exposure is actually 1/64 second keeping the detail in the sky. 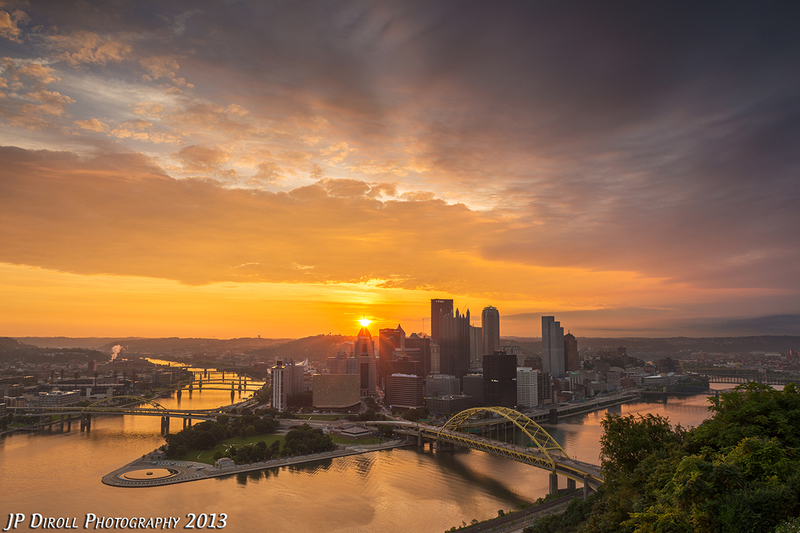 Today for my photo of the day and Throwback Thursday, I’ve chosen my oldest photo of Pittsburgh that I offer on my website or at shows, “Pittsburgh Blues.” It was taken all the way back in 2010. I say that somewhat in jest – the photo was taken almost 4 years ago, but I remember it like it was yesterday. Anyhow, I took this photo from the North Shore about an hour after the sun had set. It was a bit past blue hour, but as you can see it is still quite blue and cool. Along with this photo, I took away a couple other things. The first was that a long, or longer, exposure really helps to smooth out the reflections on a body of water. At this point in my journey of photography, I had experimented with long water exposures, but mostly waterfalls so it was fun to try it with larger body of water that was moving, but not quite “rushing.” My second takeaway was that night photography, especially in the city, will trick your camera’s sensor into underexposing your photo due to the bright city lights. Set that exposure a little longer and you can really pull out the detail of the skyline while still keeping those highlights in check. Earlier today I posted a poll over on Facebook to find out what folks would rather see…a photo of the Super Moon or a photo of the fog that rolled through last week. I was expecting a Super Moon landslide but the fog held it’s own and the surprising contender wasn’t even an option…BOTH! The Super Moon ended up winning so here it is! Last night was an exercise in patience mixed with opportunity meeting preparation…or as some might call it, a bit of luck. I spent a good hour on the West End Bridge waiting for the super moon to rear its 14% larger and 30% brighter head. Just as the sun was beginning to hide and the moon should have been popping out the clouds moved in. I could see the writing on the wall and it wasn’t a story I wanted to read. I stayed anyway. The clouds were close to the skyline so I thought maybe I’d catch the moon further in its arc above the city. Luckily, though, the clouds parted and the moon was quite visible from the time it peaked above the skyline. Thanks to some prior planning I knew where the moon would be rising and positioned myself accordingly. When the moon finally came out to play, it glowed with a brilliant pinkish hue at first and turned to orange as it continued to rise, eventually turning bright white as you would normally see. It rose very quickly and it was quite challenging to work the scene, but thanks to that bit of preparation, I was able capture a few photos of the beautiful scene before me. As a photographer, a little preparation mixed with a little luck can take you a long way! Last Monday seems like a blur. It was a whirlwind of activity and a morning of shooting unlike most mornings for me. Typically I don’t like to jump around from location to location (in the same morning or evening) trying to find that perfect spot for a photo. I like to set up shop, move around within that spot, and take advantage of the conditions before me. Sometimes, though, I need to change things up a bit and that’s what this Kickstart series is for me – breaking norms, exploring new ideas and concepts, and getting outside of my comfort zone a bit. Monday provided me with just that opportunity. Upon waking up, I checked the conditions outside my office window at home. Fog. Awesome! I grabbed my gear and headed out the door. Within a mile from home the fog was gone and I thought the morning would be foiled before it even started. Luckily, by the time the city was in my sights, I couldn’t see it! A nice blanket of fog was covering the skyline. I had a feeling Mount Washington would not provide much in terms of photos as the fog was higher up and pretty dense. I began my morning there anyway and I was right. Upon my arrival, the twilight fog was impervious. Nothing was visible more than a hundred feet or so in front of me. Dense twilight fog blankets the city, blocking any view of the skyline. I mentioned I don’t like to jump around too, too much during sessions. Well after this sight, I knew that would have to change. If I stayed in this spot, I’d have a camera full of the same scene and who wants to see that? Not me and I bet you don’t either. So I jumped in my car and headed down to the Duquesne Incline. Nothing to see there as I suspected – in fact I never even took a photo from the overlook. Back to the car for the next location. I flew down PJ McCardle and down into Station Square. I stopped by my favorite spot along the train tracks, but again the fog was too dense and I couldn’t catch any skyline. 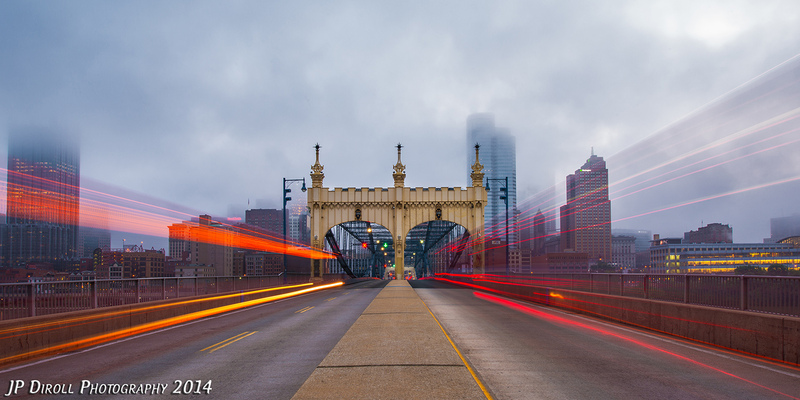 The Smithfield Street Bridge was my backup plan to the tracks and luckily, it didn’t disappoint. 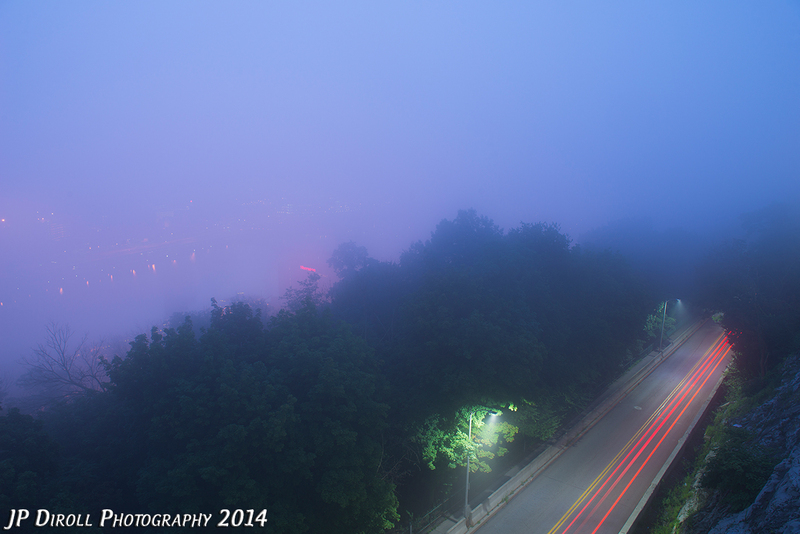 The fog was thick but not impenetrable so I was able to hop up on the Median and snag a few frames. The buses flying by combined with a long exposure allowed me to catch some nifty light trails to complement/contrast with the moodiness somewhat invisible skyline. 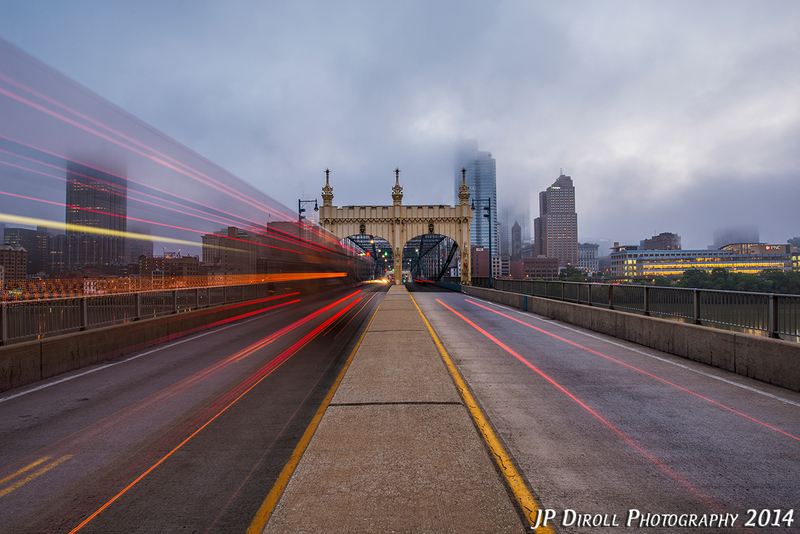 Buses flying past and long shutter speeds create an interesting dynamic to an already moody view from the Smithfield Street Bridge. Next on the plate was…wait for it…Mount Washington. Yes, I went back. I’ve had a shot in mind for years and I was hoping to get it. The conditions weren’t right and you still couldn’t see anything so I was thwarted again. Oh well. I’ll catch some day and share it all with you. Since the mountain was a bust, I headed low again to my favorite spot…the North Shore. This is where I hit my stride and found some success. 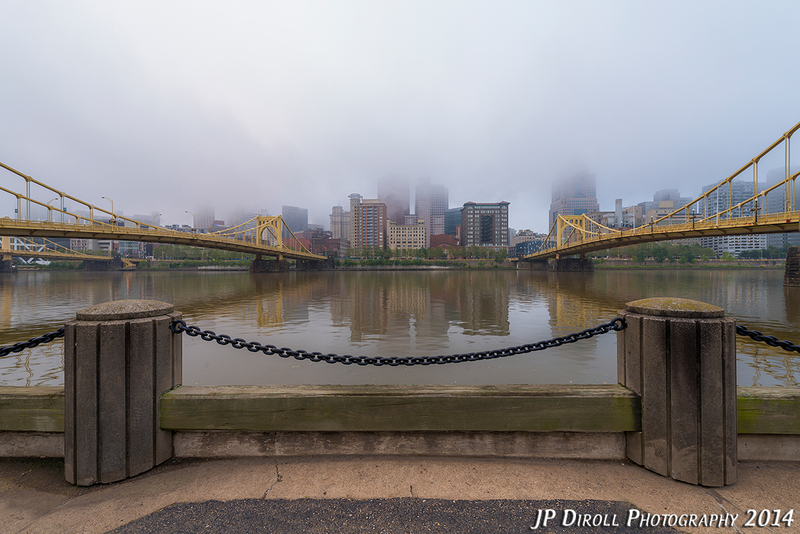 I started between the Clemente and Warhol Bridges shooting above and along the dock at water level. Conditions were pretty nice and I was able to snag a few good photos. The reflections were nice, the fog was perfect, and the foreground bollards and chained mirrored the shape of the bridges nicely. Even along the North Shore, though, I jumped around more than usual. I hit a couple spots that I like to frequent up along the Sister Bridges that I enjoy. 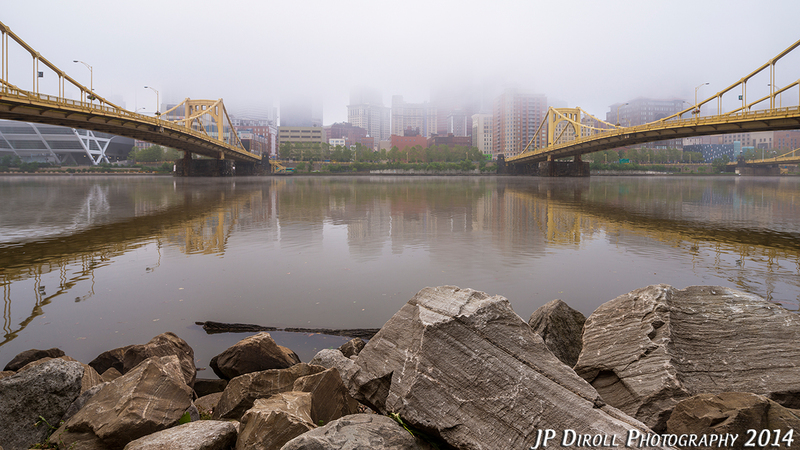 The rocky shore along the Allegheny provides an awesome foreground and makes it feel more like a landscape photo than a cityscape. The rocks along the shore provide a nice natural element to the urban scene. 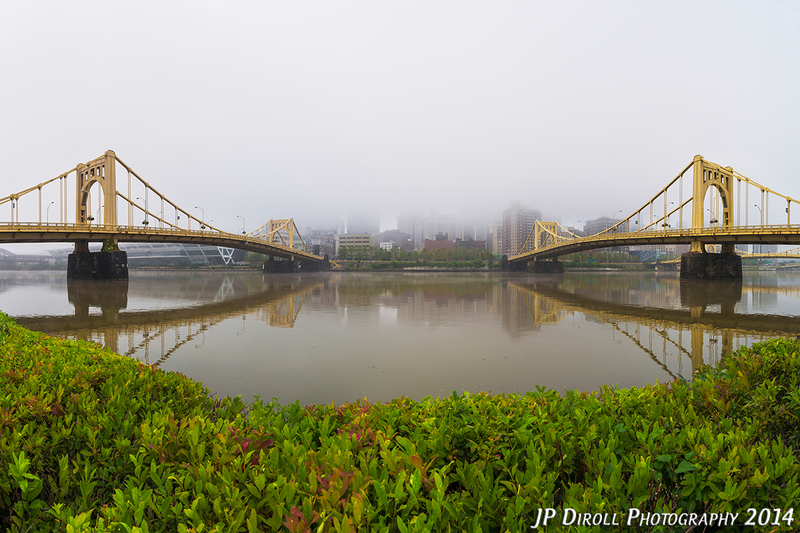 A four image panoramic captures both the Warhol and Rachel Carson bridges. For my last spot, I jumped down across from Heinz Field to incorporate the fountain. The river was very calm as I snapped the first photo featuring the fountain. As luck would have it, after that the wind picked up and the still reflections were nothing but a memory caught in one photograph. I kept working the scene, though, and incorporated some of the flowers along the river walk. I got some strange looks since I was basically standing in the tall patch of weeds, but I didn’t care. All in all, it was a fantastic morning of shooting. I’d been waiting for 3 years for fog like this and it didn’t disappoint. 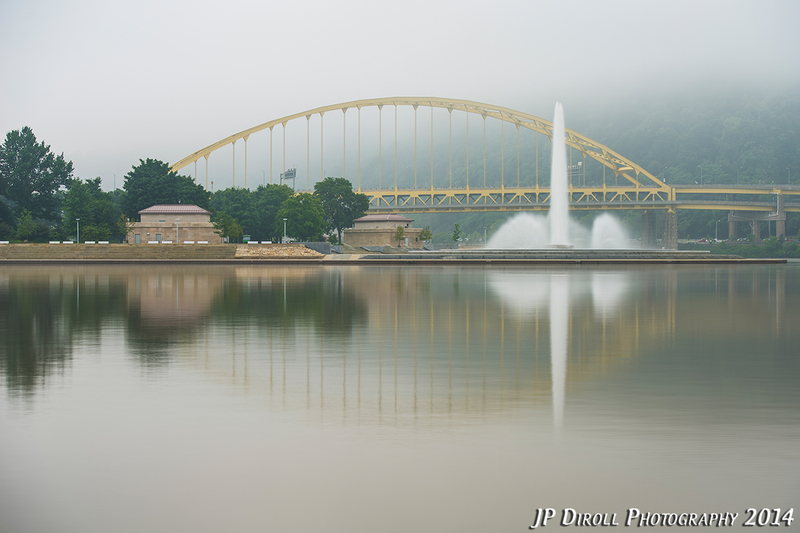 The calm waters provided the perfect setting for a foggy reflection of the fountain and Fort Pitt Bridge. Anybody else see an outline of a fish?! 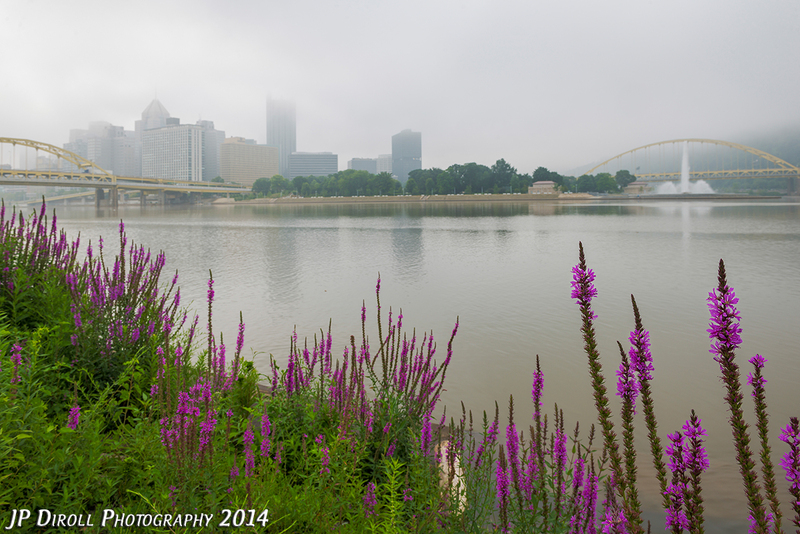 Summer blooms along the North Shore provide a nice contrast to the fog blanketing the city. After a heavy rain or the spring melt, this rock in the foreground is normally covered in water. It was relatively dry this weekend allowing for some unique and intimate photo ops. 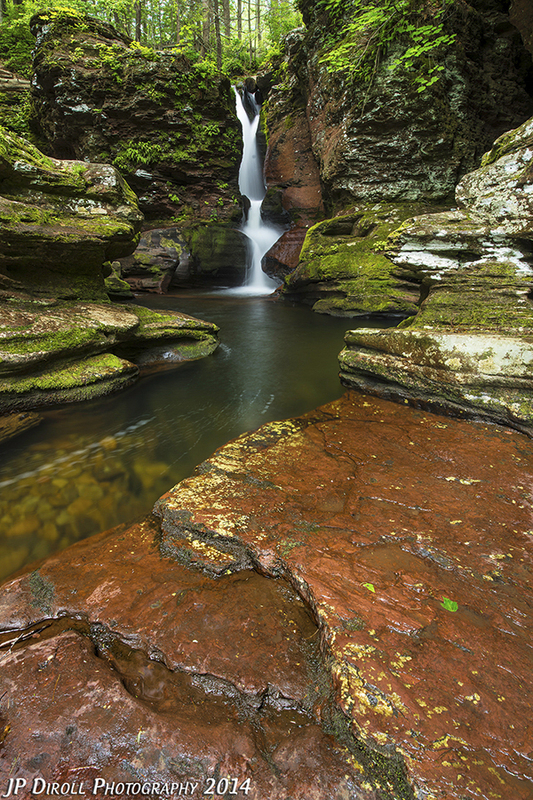 Upon doing some research on Ricketts Glen upon my return from my trip, I learned that the flow of Kitchen Creek was actually quite low. The lines in the rocks you see in my photo are only visible with the water level is low. Most of the photos I’ve seen of this location, in fact, feature a heavier flow. More water falling would mean that I would not be able to catch this perspective. While shooting, I never had thought about the water level being higher and how it would effect my camera placement and setup, but looking forward I’m excited for a heavier rainfall so I can explore some new compositions. Today was a long time coming. 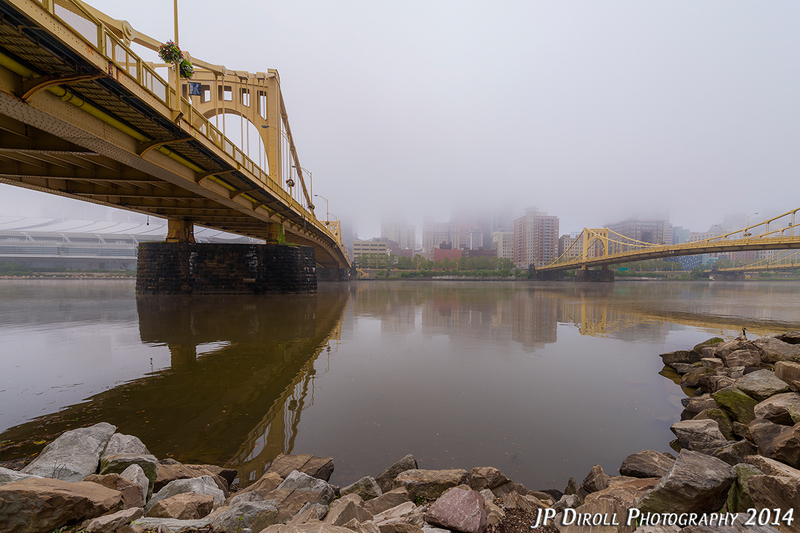 One of the best natural elements or weather conditions to shoot in is, in my opinion, fog. I’m always on the look out for it. It adds an eerie mood to a photo and really translates well to monochrome. The best fog I can remember in the city was late in 2011 and ever since I’ve been waiting for it again. Well it came today…and it came with a vengeance. I’m not going to get into great detail here today because I’ll be using the photos from today for my Kickstart blog post next Monday (sorry, no Kickstart today as I was unable to make it out last week 😦 ). Anyhow, it was a pretty productive morning, starting on Mount Washington hitting three different overlooks, but the fog was far too dense. I’m not one to miss an opportunity so I set out on a mission…I was going to shoot this fog. I headed south and landed at the Smithfield Street Bridge. It’s a great little bridge as the concrete barrier allows you to climb up and set up shop. For this particular image, I wanted long and drawn out light trails. The sun was rising quickly so my shutter speed was getting shorter and shorter. As my exposure gets shorter, so go my light trails. Luckily I was able to catch a few buses who didn’t have a problem speeding. There quick pace allowed for a 2.5 second exposure with a nice elongated light trail. The finished produce is actually two 2.5 second exposures stacked on each other. Enjoy! Generally speaking, I like my photos of the city to be without people. That may sound counterintuitive as cities are created by people and are intrinsically needed for the city to thrive, but that’s just how I prefer my photos. That being said, every so often I get a request from a client wanting people to be in a few photos. They don’t necessarily need to be the largest element in the frame or even prominently featured, but they want a human element present. Sometimes (not all the time) I get pretty excited about these requests. To me it represents a challenge and an opportunity to leave my comfort zone, if only for a few hours. 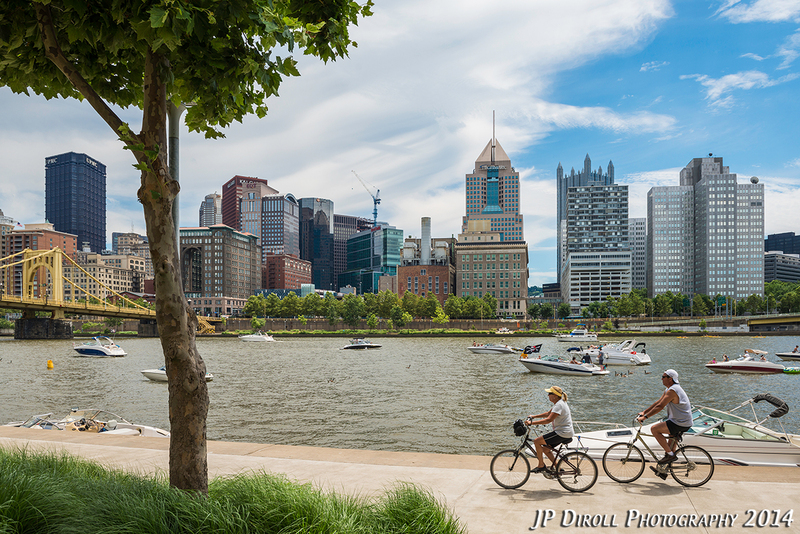 For this particular photo the client wanted bikers and they would probably prefer them on the North Shore Riverfront Trail. Great! I love the North Shore. However, this photo was a bit of a struggle compositionally and there were lots of outtakes from several spots along the river. I finally settled on a little open patch of grass below PNC Park. I sat there, camera in position, waiting…and waiting…and waiting. Bikes would pass but at the same time they’d cross with a jogger or another biker coming the other way. After several attempts these two bikers crossed my path and I had the shot. Personally, I think this photo would be very off balance if the bikers were not incorporated and that human element really completed the composition. What do you think?